We travel to the City Pool that has five lifeguards monitoring all sections that include a “beach area,” shallow water, lazy river, waterslide, a separate deep end, and diving board area to accommodate both experienced and non-experienced swimmers. The children have individual tags that travel with them from one area to the next and given to the Wonderland staff member in that area to ensure that every child is accounted for no matter what section they are in at any given time. 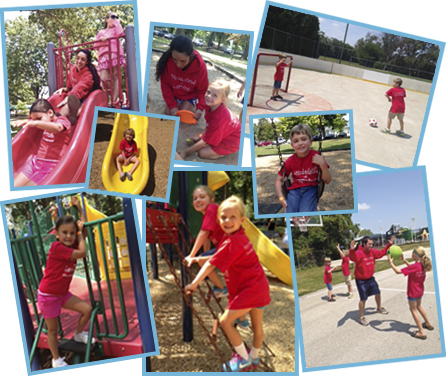 Traveling to our local city parks gives the children an extra large outdoor space to run, climb and play on developmentally appropriate gross motor equipment and a chance to be involved in group/individual games provided by our staff while they participate with them. Appropriate children’s movies are chosen to see sporadically throughout the summer. Our entire group sits together while enjoying the show. After enrolling the children in a free, local bowling program, we go to the alley for some fun while working on techniques for a few games. Copyright © Wonderland of Learning School Age Center | Web Design: Silecchia Inc.